National Geographic magazine recently named the Duck River in Tennessee one of the most biologically rich places in the world. This is an important recognition bringing worldwide attention to one of our natural treasures in Tennessee, and it makes our Duck River Opportunities Project conservation work even more important. The Duck River is also the most biologically diverse river system in the nation with more than 151 different species of fish – more different types of fish than all of Europe. The river is also home to over 50 types of mussels. The health of these amazing and diverse populations is indicative of the health of the ecosystem, and a thriving ecosystem means clean air, clean water and a healthy environment for communities. Sediment is the most common pollutant in rivers, streams, lakes and reservoirs according to the Environmental Protection Agency (EPA) and the Duck River is impacted by this problem. Urbanization and agriculture are causing degradation of fish and wildlife habitat in middle Tennessee. The most valuable of this habitat for fish is located in stream side areas that protect water quality and fish habitat from sediment and habitat destruction. Our region continues to attract people and businesses which develop areas that have been historically used for wildlife or farming. Roof tops and parking lots remove the land´s ability to absorb precipitation, increasing flooding and decreasing summertime flows by limiting groundwater recharge. Urban stormwater moves more quickly than normal because of smoother surfaces and less vegetation to capture and slow down the rain run off. This runoff also carries more trash, debris and pollutants and has a higher temperature. These traits contribute significantly to the degradation of fish and wildlife habitat in streams. 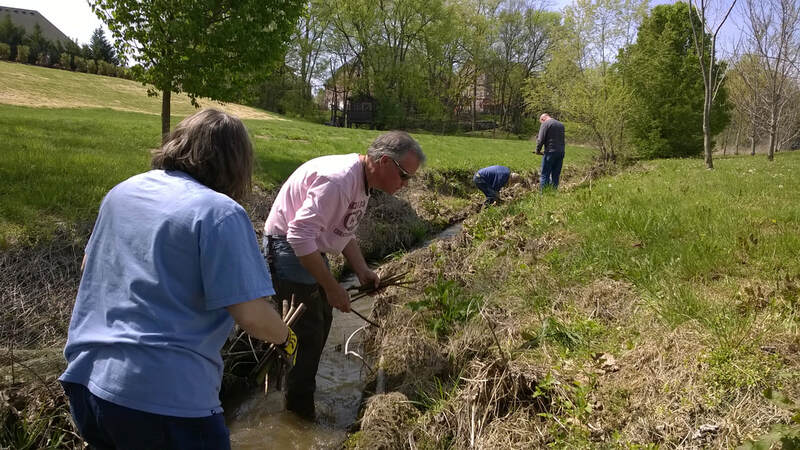 A healthy stream contributes to the health of the community through cleaner drinking water, increased biodiversity, improved recreational opportunities and more. Installing revetments (cedar timbers wrapped in coir mat) on to the eroded bank to prevent further deterioration of the stream bank. 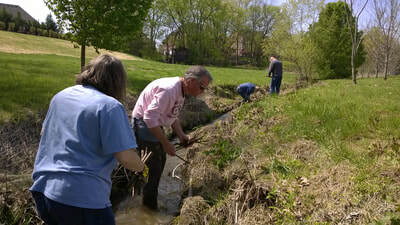 Reforesting the stream banks one tree at a time and live staking to stabilize the soil and help improve water quality. Installing rain gardens. Rain gardens add beauty to the landscape and reduce flooding by allowing storm water to be absorbed by the plants and infiltrated into the ground. If you would like to join us on one of these projects visit our volunteer opportunities page. In 2009, the Duck River Opportunities Project received the Tennessee Governors Environmental Stewardship award, because of work to protect this most valuable natural resource. Click here for more information. The Council also works in conjunction with Friends of Henry Horton State Park to educate 5th grade students about the Duck River Watershed training them to be stewards of the river. The Duck River Opportunities Project is made possible through your generous donations to the Council and by a grant from the Tennessee Department of Agriculture and the U.S. EPA. MAKE A DONATION TODAY TO SUPPORT OUR WORK IN THE DUCK RIVER. CLICK HERE TO DONATE. 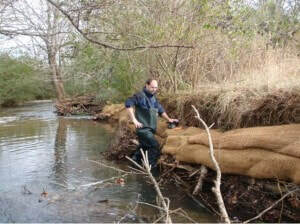 Kevin Burke inspects revetments designed to protect the stream bank and encourage re-vegetation and prevent further erosion. 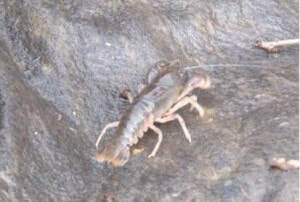 This crawfish is a great example of the biodiversity found in the Duck River Watershed. 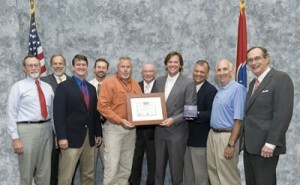 The Duck River Opportunities Project (DROP) in Spring Hill received the 2009 Governor´s Award for Excellence in Aquatic Resource Preservation. (l-r) Marshall Spencer, Duck River Watershed Association; Deputy Governor John Morgan; Spring Hill Mayor Mike Dinwiddie; Pat VanRyckeghem, GM Spring Hill; Beau Herring, City of Spring Hill; TDEC Commissioner Jim Fyke; Kyle Duvall, TN Environmental Council; John McFadden, TN Environmental Council; Daniel Boone, TN Scenic Rivers Association; TDEC Deputy Commissioner Paul Sloan.